CNet reports that Picasa Web Albums will add some interesting features today. 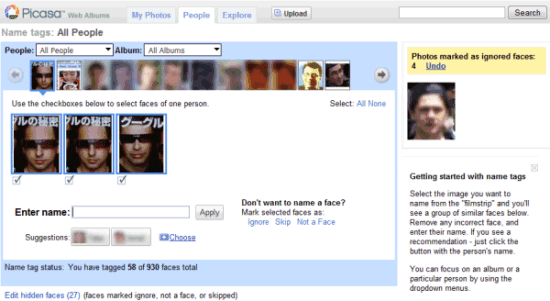 After implementing face detection in the image search engine, Google adds face recognition in Picasa Web Albums to facilitate photo tagging. "The problem with tagging is that it's a chore, so most people don't bother. But Picasa's name tag feature automates the process enough--and provides enough reason to use it--that I believe many users will take the tagging plunge. (...) The most impressive moments are when Picasa presents a large array of photos with the same face, and you can label them all with a single click," says Stephen Shankland from CNet. The technology comes from the NevenVision acquisition and I'm sure we'll see more features that depend on image analysis in the future. Other new features in Picasa Web Albums: new views for exploring photos uploaded to Picasa Web Albums, Creative Commons licensing and an option to add photos by email. Interestingly, the people tagging feature will not be available in Picasa 3, which will also be released today. The software will finally synchronize photos with Picasa Web Albums, but the synchronization is unidirectional. You'll be able to create videos from photo albums and export them to YouTube. There's also an improved collage maker that lets you control how pictures are arranged. Picasa 3 and the updated Picasa Web Albums are set to be available today at 12 pm PDT. Update: Picasa 3 can be downloaded from http://dl.google.com/picasa/picasa3-setup.exe (thanks, Anonymous!). It is 12:18, but I still can't see this feature, the only interface is changed. Does anyone have the link to the new Picasa software version? Where is Picasa3? It seems that the direct link to version3 beta is now taken back by Google. This link just gives me an "404 NOT_FOUND - unable to process request" error. i m a big fan of Picasa clinet and Web Album. 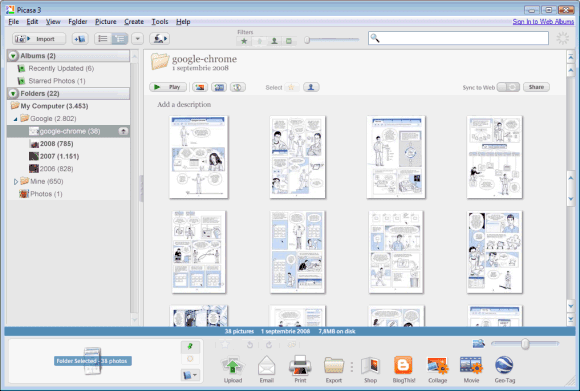 ( give us sub folder option on Picasa Web Album). its Googolplex time better then Flickr. / feature Drawback , which force me to uninstall Picasa 3 and re-install picasa 2.7.
in picasa 2.7 when i m going to upload few photos a pop windows open saying which folder i want to upload it and display (drop down many) folder names alfabetically not the date wish . example : suppose i hav folders name "Dia" , " Imran" , "Deepika", "Ameesha" and . and i want to upload pix on "Dia" so i m type in drop down manu (on picasa 2.7) "d" 1st result apper is "Deepika" then i type "i" so it apper "Dia" But ultra extreme frustetion thing in Picasa 3 is that (it dont show folders name alfabetically in Drop down manu - it shows date wish folder name 1st - What the F) when i type "d" it apper "Deepika" then "i" it apper "Imran" then "a" it apper "Ameesha" no mention of "Dia" . it may be bad but deal breaking if atleast my folders name apper in drop down manu in alfabetically . so after typing "d" i know my desired folder ("Dia" ) right behind of "Deepika" . HOW COULD I FOUND MY DESIRED FOLDER NAME IN DROP DOWN MANU FROM HUGE NUMBERS OF FOLDERS. if typing "d" shows only one folder name started with "d" not the all folders started with "d". picasa 2.7 was better i m hav problem with it . when i type "d" it display all all folders started with "d" from drop down many . i know picasa 3 is in beta . i hope it will evolve better . am i able to clearly define what problem i hav in Picasa 3. my english is not so good so plz forgive me . Not available to international users. Very sad. The way faces are grouped according to similarity is very impressive, with very few mistakes, as long as the face shows clearly and the photo is of reasonable quality and is sufficiently lit up. You'll find that you can name large batches of faces effortlessly for a while, but as you get towards the end, the task becomes extremely tedious as you have to go through faces that were hard to match, naming them one by one. A good tip in this case is to name tag your photos one PERSON at a time, not one face at a time. To do this, choose the person and click "find more...". This will allow you to go through the final dregs of random faces picking out that specific person. It is easier to do this since the name tagging app keeps that person's name available for instant click, rather than you having to type it almost every time. Saved me a lot of time! set your preferred language to englisch (united states)in your settings and you find the nametagging! Thanks for the good comment anonymous, it helped me also. changing language doesn't work for me and I am in the Philippines. Typical American attitude. United States is not the whole world !! Is it possible to change the picture for the tagged person. It seems to be the first image I tagged but what if I wanted to change that thumbnail? Is that possible? is there any API from google that can generate people tags on an any given image ( sent via an api)? Unfortunately, there's no API yet, but you can star this issue to raise the priority. How can I turn off people search, I have thousands of photos in sorted folders and dont need or want it. It is also pulling up photos from my "Hidden Folders" which is verry dangerous and embarasing. Is there an off button??????? ?